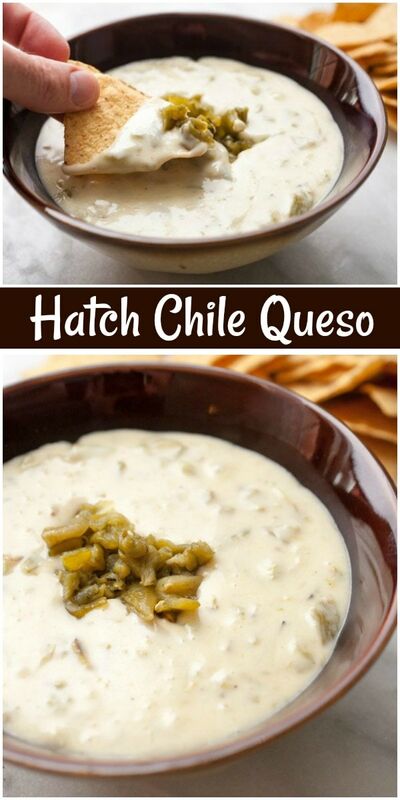 Hatch Chile Queso is a delicious dip recipe to make whenever you can get your hands on some Hatch chiles. This is a delicious, cheesy dip served warm with tortilla chips. Here in Colorado, this time of year is a special one because you can get freshly roasted Hatch chiles in most markets and stores. Typically, there will be someone outside with a huge burner roasting the chiles right in the parking lot! Hatch chiles are large fleshy peppers. They are grown in New Mexico’s Hatch Valley. If you live in the Southwest (Texas, New Mexico, Arizona and California), you’re likely to see them everywhere in the fall. They’re abundant in the markets, and in some locations you’ll be able to spot Hatch chile stands where they sell them already roasted too. 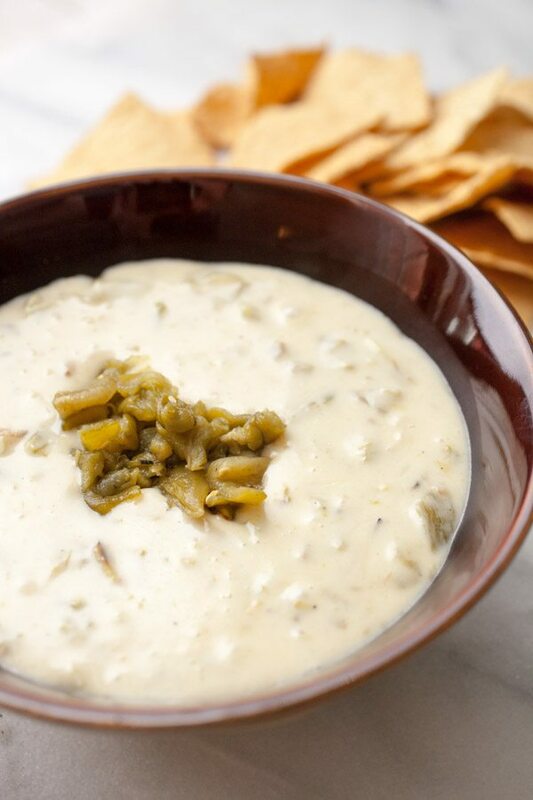 If you live in a state that’s lucky enough to get these Hatch chiles, you absolutely have to try this queso. It’s just spicy enough and has tons of flavor. If you can’t find freshly roasted chiles though, fear not because you can roast your own. How do you roast Hatch chiles? Place the chiles on a baking sheet: Arrange the chiles in a single layer on an aluminum foil-lined baking sheet. Roast the chiles on one side: Place the chiles under the broiler and roast until the skin is charred and blistered, about 3 to 5 minutes. This queso can be made in just a few minutes. I like to remove the seeds from my chiles and then chop them along with a few shallots. Cook the chiles and shallots in butter over medium heat and then stir in flour to form a roux. Once the roux has cooked for a minute, whisk in some milk to form a thick sauce. Then add all your marvelous cheese. Personally, I think Monterey Jack is best for a queso like this. Once the cheese has melted, season the dip with salt and pepper and serve it while it’s hot with a big pile of tortilla chips. Hopefully, I’m not the only Hatch chile lover out there! 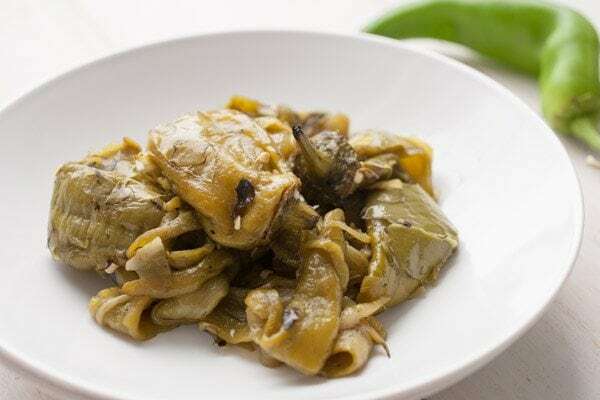 Is there a substitute for Hatch chiles? If you’re not able to locate Hatch chiles in your area, poblano peppers are a good substitute for Hatch chiles. 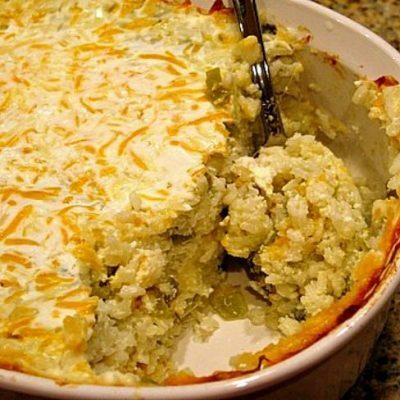 Or you can simply substitute canned green chiles! These are the real deal though! Here are few more appetizing dips that you might like to try! Such a wonderful cheesy dip with a little bit of spice! Cut open the roasted green chiles and scrape out the seeds. Then chop the green chiles and shallots. In a medium pot over medium heat, melt the butter and add shallots and chiles. Cook, stirring regularly, until the shallots are softened, 3 to 4 minutes. 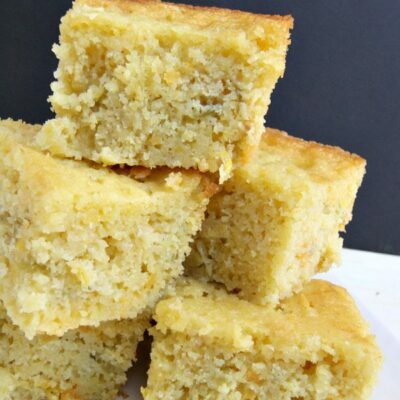 Stir the flour into the pot and cook for a minute or two until the mixture forms a paste. Slowly drizzle in the milk, stirring constantly to avoid lumps. A whisk helps, but you can also just use a spoon. 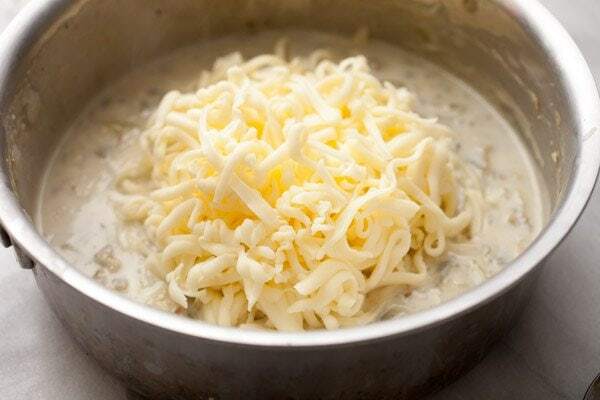 Once the milk is added, stir in the grated cheese. When the cheese is melted, season with a pinch of salt and pepper. 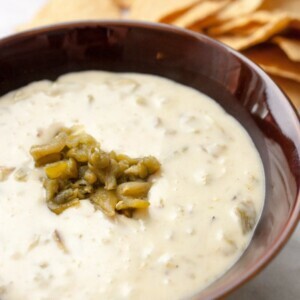 Serve queso immediately, while hot, with tortilla chips and garnish with a little extra green chile on top. 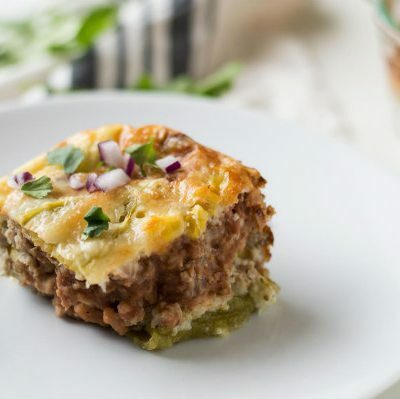 If you cannot find fresh roasted Hatch chiles in your area, you can substitute one 5-ounce can of chopped green chiles, either mild or hot, depending on your preference. Roast your own Hatch chiles: Place the chiles on a baking sheet: Arrange the chiles in a single layer on an aluminum foil-lined baking sheet. Roast the chiles on one side: Place the chiles under the broiler and roast until the skin is charred and blistered, about 3 to 5 minutes. I always add some minced garlic to the onions I chop fine, when making the roux. On the top of the finished queso, I scatter green onions. It makes it lovely. I am fond of a Cheddar/Monterey Jack mix cheese. That looks like such a tasty appetizer! 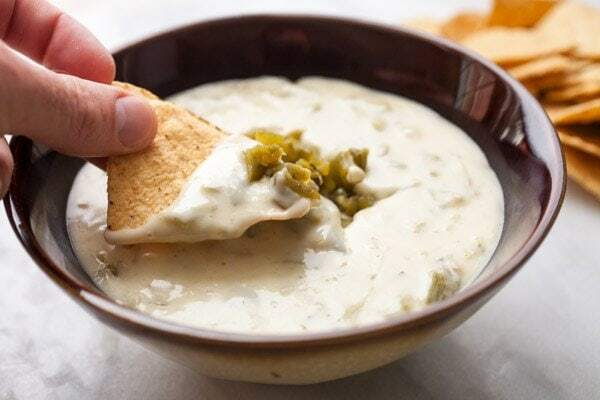 I’m always a fan of queso dips! Total YES! This dip looks killah!!! !